In search of good lectures about Mesopotamian Music, we came across this some twenty years old lecture by Rabi Paulos Khofri in Tehran. We thought it is a good source for education about our music so we put it on YouTube in three different clips as well as on aasacvcc.blip.tv. The blip.tv is one full 20-minutes clip. The following slide show is a two minute sample from Assyryt No. 1. 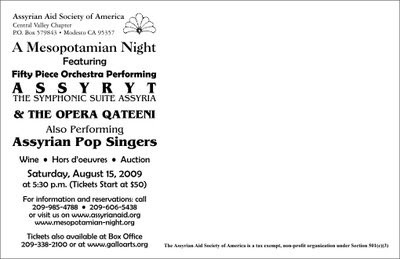 Mesopotamian Night 2009 will present two 10-minute Symphonic Suites named Assyryt No.1 and Assyryt No.2. Last year after successful completion of the Mesopotamian Night 2008, we lost one of our committed members late Susan Rasho. Susan helped us with both MN-2007 and MN-2008 projects and profoundly influenced us by her “selfless” character and her unselfish commitment to our cause. The projects that we were involved in were tiring and sometimes stressful. But we are grateful that we got to know individuals like Susan through being part of the AAS-A team. We will be celebrating MN-2009 project in memory of our friend Susan Rasho. She has touched our humanity in ways that will last with us forever. God bless her soul. Here is a short biography of Susan written by her daughter Arbella. Susan Rasho, an AAS-Central Valley Chapter committee member since 2006, was born on March 25, 1956 and passed away on October 19, 2008. She was born in Baghdad, Iraq and came to the United States in 1974 to Chicago, IL. The family then moved to Modesto, CA in 1988 where they currently reside. Susan was a wife to Ashur Rasho and a mother to three children: Mark, Ramsen and Arbella. 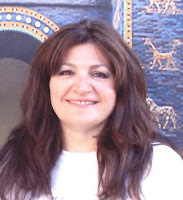 She helped in the planning of the last two AAS Mesopotamian Night events in 2007 and 2008. She was also the Treasurer of the Ladies in Diaspora group. Her creative talents were put to use in many fundraiser events to help our brothers and sisters in our homeland. Not only was Susan a great asset to the AAS team, but she was a trustworthy friend to many. It was in her character to give useful advice and be there when someone needed a listener. Her strong Christian faith radiated through her actions and words. Susan Rasho will be missed and forever remembered. The Mesopotamian Night 2009 post card will be sent out soon! Click on the image to view the information. Here is a few lines describing the dedicated members of the AAS-A Central Valley Chapter and the Mesopotamian Night project. Elki was born in Modesto, California. She earned her degree in Political Science from California State University, Stanislaus where she currently works as an Administrative Coordinator. She resides in Modesto with her husband George and children Andrew and Arbella. 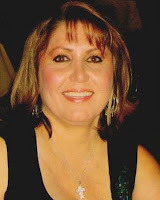 A fervent supporter of AAS, Elki is currently the VP of the Central Valley Chapter of AAS-A. Rita was born in Dora, Iraq. She moved to U.S.A in 1975. Rita has an associate degree in accounting and business from Truman College, Chicago, Illinois. She has worked in banking system for over 25 years has has a California real estate license. 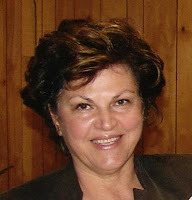 Rita has been a volunteer for the Assyrian Aid Society of America Central Valley Chapter since September 2006. She has also served as vice president of the United Assyrian Chaldean Woman Union in Diaspora for two years. Rita is married to Albert Mulhim and has three children Rosemary, Ramson and Ryan. Tony was born in Urmi, Iran. He finished his high school in Urmi. He earned an Electrical Engineering degree from Tabriz University in 1987 and then moved to Tehran. In Tehran he earned a Masters degree in Electrical Engineering and completed his Ph. D. course works in Biomedical Engineering. In 1991 he moved to US and joined Northwestern University in Evanston to complete his Ph. D. degree. However he later settled for a Masters degree in biomedical engineering from Northwestern in 1995 and joined the workforce as a software engineer. Since then he has worked in various medical and telecommunication industries as a senior software engineer. Currently he works for a startup telecommunication company in Bay area California while he lives in Modesto with his wife Nahrin and three daughters Ayla, Edena, and Elona. 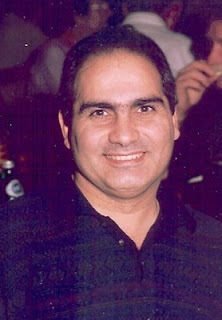 Tony has worked and contributed to various Assyrian organizations. In Urmi during 1980s he was one of the founders of Nissan Cultural and Art Association. He was also a member of Urmi branch of editorial board of Ishtar bi-weekly. When he was in Tabriz, along with other Assyrian students he helped revive the Assyrian Youth Center of Tabriz which published a newsletter and performed nationalistic performances. In Tehran while a graduate student he joined the Assyrian Youth National and Cultural Association and for several years served as member of its central committee. In Chicago, for several years he has served as a member of board of directors of the Assyrian Academic Society. In the past three years he has served as the president of the AAS-A Central Valley Chapter. Sargon was born in Dora , Iraq , but his father moved the family to Kuwait in 1975 to seek employment opportunities. After graduating from high school Sargon moved to the U.S. in 1987 to join his uncle and lived with him in Sunnyvale , CA. The rest of Sargon’s family joined him four years later and settled in San Jose , CA. Sargon received his Associate degree in business from De Anza College in Cupertino , CA and pursued his education at San Jose State University for a Bachelor degree in Accounting. Later he switched to University of Phoenix and graduated in 1999. He’s worked as an accountant since 1993 and currently he holds the position of vice president of finance for a manufacturing company in Livermore , CA . In late 90’s, he joined the Assyrian Aid Society- San Jose chapter by serving as their Treasurer. Working along side great individuals such as Ashur Yoseph, Youkie Khaninia , Fred Aprim, Fouad Sada, Neil Karaman , Sam Kasim and others made Sargon realize the passion of helping our people. In 2001, Sargon married his lovely wife Rita and moved to Modesto , CA . They now are blessed with two daughters Bretele and Edessa. After few years away to take care of his new family, Sargon has decided to join the AAS-Central Valley chapter as their Treasurer. Mrs. Bata Sada-Younan was born in Barwar, Iraq and spent her childhood in Basrah. She received her Bachelors degree from University of Basrah in Geography. After teaching high school for seven years she immigrated to Canada in 1980. Her family relocated to Modesto, CA to be closer to the Assyrian community. Bata started working with AAS in 1992. She was among the pioneers who greatly contributed to the foundation of the AAS-Central Valley Chapter. She is a believer that knowledge is power and that the only way to maintain our culture, language and history is through continued education of our young people. She is a passionate supporter of the AAS because of the support it lends the Assyrian schools in Northern Iraq. She is married to Andreous Younan and has three daughters, Vian, Marian, and Suzan. "I'm devoted to AAS because of our hard work in maintaining our roots in our homeland. I have been involved with AAS long enough to see our dreams of having Assyrian language schools come to fruition. It is a pleasure to see those young students who have started out in elementary school and who now have gone on to graduate from college." Fred Isaac was born in Baghdad, Iraq in 1960 and immigrated to the United States with his family in 1977. He joined the work force at the age of 18 while attending school and received AS degree in Graphic Arts in 1981. He established Artistic Printing Inc. in Modesto, California, in March, 1981. Fred has actively served in many charity organizations. He is a member of Rotary International (Modesto East Club) since 1990 and has served as a its president (2006-2007) and two terms as International Director. He has served as a president for AAS-A Central Valley Chapter, vice president of the Board of Directors (1999-2000) of St. George Assyrian Church of the East, president (1990) of St. Zaia Youth Group, and vice President (1980) of the Assyrian Student Association at Modesto Junior College. Fred is married to Romella since 1985 and has one son Elbroun. "I first got involved with the AAS-A (Central Valley Chapter) in 1999, It has been an honor to be part of such organization and serve along side so many honorable and dedicated individuals, in my opinion AAS-A is the most reputable and trustworthy organization with great track record in helping our people in need and with humanitarian projects." 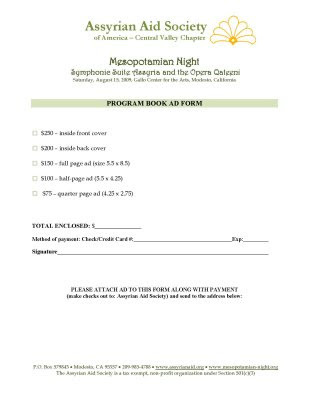 The ad form for Mesopotamian Night 2009 event is ready. Your ads cover our printing costs for the event including the program book. By advertising in our event you get exposure to a large audience. Consider advertising for your business or your book and art works or honor a loved one by purchasing a one page memorial ad for a family member or a friend. 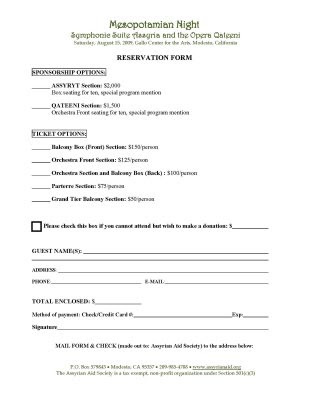 Please print the following page and mail it to us with your information and payment or email us at aasacvcc@gmail.com. In recognition of the culturally gifted persons in our community who have worked ceaselessly to advance arts and literature, the AAS-Central Valley Chapter announces the Mesopotamian Achievement Awards in Arts and Literature. With these awards, we will honor men and women who have dedicated themselves to bringing our artistic and literary heritage forward. Two awards will be presented in a ceremony as part of the Mesopotamian Night annual fund raiser concert 2009. 1. The Mesopotamian Arts Award (Raab-Amne) to be presented to Assyrian calligrapher and journalist Rabi Issa Benyamin. 2. The Mesopotamian Literature Award (Raab-Sayoomeh) to be presented to Assyrian writer, poet and publisher Rabi Daniel Benyamin. Some of our audience have asked us about our plans for popular music section in Mesopotamian Night 2009 concert. We would like to gladly inform those passionate for our popular music that this year two Assyrian singers Lida Lawando and Emanuel Bet Yonan will perform with a 50-piece orchestra. This is rather unprecedented and even surpasses what we offered last year. We will soon announce the detailed information as they become available. But rest assure we have not forgotten our pop and folklore music! 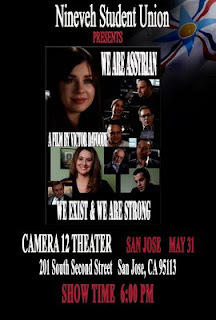 A new Assyrian film, We Are Assyrian, will have a screening in San Jose, California on May 31, 2009. Nineveh Student Union of the Bay Area and Central Valley are presenting this film to the Bay Area Assyrian community for the first time. This film is produced and directed by an Assyrian filmmaker, Victor Davoody. It's a beautiful documentary that portrays the night of the Mesopotamian Night concert of August 2008 in a way that has never been seen before. There are scenes from the night of the concert, interviews with our great singers, Ashur Bet Sargis, Walter Aziz, Lorraine Davis, and touching interviews with famous Assyrian musicians and Assyrian Aid Society members who organized this concert. For the first time, we see our music captured in a unique way and a new level of appreciation. Being present at the concert last year is not the only way to enjoy this film and appreciate Assyrian music, you will enjoy it either way! You will enjoy it just as much or even more than if you were actually there. We Are Assyrian is the most beautiful film that portrays our culture today, most of which is being preserved through Assyrian music. It's coming to San Jose sooner than you think, so please reserve your ticket(s) as soon as possible. WE EXIST, ARE STRONG, WE ARE UNITED! Nineveh Student Union of Northern California was created August of 2008 and it exists to promote cultural, academic, and nationalistic awareness among the Assyrian Chaldean Syriac students in the Diaspora. As a result, the Nineveh Student Union is building a structure and a bridge between the Assyrian Chaldean Syriac students in our ancestral Homeland of Beth Nahrain and those students in the Diaspora. It will be developing communication and unity of ideas and projects with other Assyrian Chaldean Syriac student groups throughout the world. Promoting our culture with innovative ways, encouraging academic achievements and introducing nationalistic awareness among our students will be the foundation of Nineveh Student Union to help preserve our culture, language, and history. These endeavors and principles will prepare the students for future responsibilities that will benefit our Nation. We are hoping Mesopotamian Night 2009 will be an occasion to honor Rabi Issa Benyamin, a living Assyrian legend among us. In the past two Mesopotamian Night concerts, while he has not been able to attend, he has been a gracious contributor by sending us beautiful pieces of calligraphy to auction. We are hoping he will be in good health snd will be able to join us this August. It is worth mentioning that Rabi Paulos Khofri and Rabi Assurhadoun Khorfi are Rabi Issa's first cousins. We are presenting here an article contributed to this blog by the Assyrian scholar Eden Naby. Dr. Naby this year is joining us as an honorary committee member and a major sponsor of the Qateeni Opera. - He worked to restart Assyrian journalism among Assyrians in Iran after the genocide had dealt a grievous wound to a culture with the oldest tradition of periodical publication in all of Iran. - He has created beautiful art works that give new life to our written word, the oldest continuous written and spoken language of the Middle East. 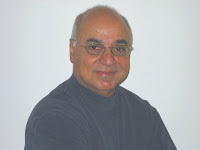 Rabi Issa now lives in Illinois (USA) but he was born in Tabriz (Iran) to a family originally from Salamas. In 1924, the year of his birth, Mirza Benyamin Kaldani (1879-1966) and his wife Esther were still refugees in Tabriz, waiting, like thousands of other Assyrians from Urmiah and Salamas to return to the towns and villages they had been forced to abandon between 1914 and 1918. Only one-third of the Assyrians living in the string of settlements stretching westward from Urmiah to Urfa (Edessa), survived the attacks by Kurds, Turks, and Azeris. Less than half that portion were ever allowed to return to reclaim their homes. The others entered the diaspora in Russia, Georgia, Armenia, Ukraine, Kazakhstan, Uzbekistan, many parts of the Middle East, Europe, South and Central America, the US, Cananda, and then Australia and New Zealand. The pattern of persecution of Christians in the Middle East continues and adds to Assyrian refugees especially from Iraq. Returning to Urmiah, Mirza Benyamin continued his activities in Assyrian cultural circles, working closely with Mar Havel Zaya (1892-1950), the Archbishop of Urmiah and Salamas. Rabi Issa’s love of his mother language gained encouragement from Mar Zaya, his mentor and teacher from the age of seventeen. As he built his professional life and started a family, Rabi Issa worked as a math teacher, and later as a human resources administrator at the Iranian environmental ministry in Tehran. He married Clara Manassarians of a leading family in Golpashan, and they raised a son, Ramsin and a daughter, Ramica, both of whom have played key roles in promoting their father’s journalism work and his calligraphy. Rabi Issa’s most artistic contribution to Assyrian culture lies in the field of calligraphy. Some of the most beautiful and creative tableaus of our words and alphabet have flowed from his pens – on paper and on leather. Many exemplars may be seen in the book Assyrian Calligraphy but others are in private homes such as that of his niece, the operatic singer, Marganita Vogt-Khofri of Zurich. Words take shape, in the hands of this master, to suit their meaning so that they may inspire us to action: khuyada (unity), or teach us to avoid their curse: pulaqa (divisiveness). In another creative use of Assyrian calligraphy Rabi Issa enfolds the letters of a person’s name to form an inspiring shape suited to that person’s contribution to Assyrian culture. Arian Ishaya, Rosie Malek-Yonan, among others have been honored with such personalized calligraphy. Anyone who has seen the calligraphy of this great artist will know why has been honored with awards in Paris, Tehran, Chicago, San Jose and why his work has been exhibited at the Smithsonian Folklife Festival in Washington, DC. 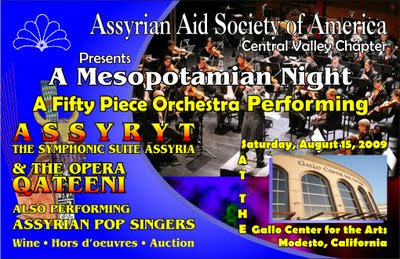 AAS-A Central Valley Chapter has asked John Kendall Bailey, a conductor from the San Francisco Bay Area to conduct our 50-piece orchestra for the Mesopotamian Night concert 2009. Mr. Bailey will closely work with Ms. Raeeka Shehabi for the production of the Qateeni opera as well as the Death of Enkidu scene form the Gilgamesh opera. John Kendall Bailey is Music Director, Principal Conductor and Chorus Master of Trinity Lyric Opera, Music Director and Conductor of Voices of Musica Sacra, Associate Conductor of the San Francisco Composers Chamber Orchestra, and Artistic Director of the San Francisco Song Festival. In 1994, Mr. Bailey founded the Berkeley Lyric Opera and served as its Music Director and Conductor until 2001. Since then he has been a guest conductor with the Oakland East Bay Symphony, American Philharmonic-Sonoma County, Oakland Youth Orchestra, and Oakland Ballet, and music director and conductor for productions with North Bay Opera, Pocket Opera, Mission City Opera, the Crowden School, Dominican University, Thick Description, Goat Hall Productions, Opera Frontier, Solo Opera, Shoebox Opera, and Golden State Theater Productions. He has recently conducted the premieres of two of David Conte’s operas, America Tropical and Famous. Mr. Bailey has taught conducting at the University of California at Davis and Notre Dame de Namur University. As a choral director, Mr. Bailey was Chorus Master of the Festival Opera of Walnut Creek from 2002-2006, Chorus Master for Opera San Jose in 2009, and has been guest conductor for the University of California-Berkeley Chamber Chorus, the University of California-Davis Chorus, Chamber Singers, and Alumni Chorus, and the Berkeley Broadway Singers. Mr. Bailey is also a composer, and his works have been performed and commissioned in the Bay Area and abroad. Mr. Bailey also maintains a busy performance schedule as a baritone, oboist, and pianist, and has performed with the San Francisco, Santa Rosa, Oakland East Bay, Berkeley, Redding, Napa, Sacramento, and Prometheus symphonies, American Bach Soloists, Philharmonia Baroque Orchestra, the Midsummer Mozart and West Marin music festivals, San Francisco Bach Choir, Coro Hispano de San Francisco, Pacific Mozart Ensemble, Sacred and Profane, California Vocal Academy, San Francisco Concerto Orchestra, Masterworks Chorale of San Mateo, Baroque Arts Ensemble, San Francisco Korean Master Chorale, the Master Sinfonia, the Mark Morris and Merce Cunningham dance companies, Goat Hall Productions, Opera Piccola, the Berkeley, Golden Gate, and Oakland Lyric Opera companies, and many other groups. He has recorded for the Harmonia Mundi, Koch International, Pro Musica, Wildboar, Centaur, and Angelus Music labels. Mr. Bailey has been a pre-performance lecturer for the Oakland East Bay Symphony, San Francisco Opera, American Bach Soloists and Festival Opera of Walnut Creek, a critic for the San Francisco Classical Voice, and a writer of real-time commentary for the Concert Companion. It is an honor to announce that AAS-A Central Valley Chapter has asked Mr. Obelit Yadgar to join us again as the master of ceremonies. The tremendous positive feedback that we received from our audience as well as those that have watched the Mesopotamian Night 2008 DVD, encouraged us to invite him again to help with another successful event in 2009. Mr. Yadgar has promised to contribute to this blog in the coming months. Obelit (“Obie”) Yadgar has enjoyed a dual career as writer and radio broadcaster. He spent more than 30 years as classical/jazz music radio host and arts interviewer for commercial and NPR stations in major U.S. cities. Obelit’s writing career began with his tour of duty in Vietnam as a U.S. Army combat correspondent. Since then, he has written short stories, print and online magazine features and essays, radio/TV commercials, promotional and industrial video scripts. Obelit’s essays on the Assyrian life appeared in Zinda Magazine (zindamagazine.com) in his column Musing With My Samovar. “Will’s Music,” his first novel, published in 2005, is a love story based in the world of radio and dance. His second book, “Obie’s Opus,” published in 2007, sprinkles tiny bits of Obelit’s autobiography with a large collection of amusing little stories and anecdotes about the great composers. Currently he is finishing a second novel. His books are available from: obieyadgar.com. Obelit, who is of Assyrian heritage and is named for the Assyrian King Ashur-Uballit I (1363-1328 B.C. ), credits his writing inspiration to his great uncle, the renowned Assyrian writer, teacher and nationalist Binyamin Arsanis (1884-1957). Born in Baghdad, Obelit grew up in Iran until immigrating to America in his early teens. He lives in Milwaukee, Wisconsin, with his wife Judith. He has two daughters, Sonja and Sadie. Now he devotes much of his time to writing. Some of our audience have asked for information about Mesopotamian Night 2007, after watching the DVD of the Mesopotamian Night 2008. The Mesopotamian Night 2007 theme was different. While the theme was still cultural, but it was an outdoor event with full dinner and only one hour performance from the opera Inanna. The video recording for MN2007 is available but it was never released because of the low quality of the video. However we will try to post some video clips later. For now enjoy the moments of the Mesopotamian Night 2007. In 2008 we lost two great friends who helped us with both 2007 and 2008 events: Mr. Eric Buck Townsend the director of opera in Modesto who was instrumental in helping us bringing opera to the Assyrian community and our dear friend and hardworking member of AAS-A Central Valley Chapter Committee, Susan Rasho. This slide show is also a tribute to their memory. Some of our audience have asked to remember some of the moments grabbed by the photos that we had last year. We also added two songs by Rabi Paulos Khofri to the slide show that will be performed by a new full orchestra arrangement and an Assyrian choir in Mesopotamian Night 2009 concert. These songs were performed in Tehran, Iran during 1980s by Serinas Quartet and the choir group of Assyrian Youth National and Cultural Association of Tehran (Qindroon). Alas the heavy yoke, no end to the torture in sight. On our bitter life shouldn't shine some light? Where is the one to free us shall come? To cut the shackles from our legs and arm. Born on 17 March 1903, William Daniel belonged to the generation of Assyrians who witnessed the ravages of World War I in the Urmia region first hand. At the age of 11 he was snatched away from the comfort of his home and school and thrust into the legion of Assyrian refugees as they fled their homes with enemy forces in pursuit. After the War he settled in Hamadan and began studying music. Under the direction of an Armenian master, he excelled at the violin. He continued his musical career in Europe, at the Conservatory of Music in Basel, Switzerland and became an accomplished violinist, playing in symphonic orchestras in France and Switzerland. Returning to his homeland, William Daniel became a music instructor in Hamadan at Pahlavi High School in 1937. In 1943, after he moved to Tehran, he conducted a weekly program on national radio. There also he founded the first Assyrian music and dance group and in 1944 he published his musical compositions under the title “Zahrira-d-Oumanuta” (Rays of Art), with illustrations of performances. Among William Daniel’s great literary accomplishment is the epic “Qateeni Gabbara” (The Great Qateeni) published in three volumes and containing more than 6000 verses. In addition William Daniel has written several outstanding plays, musical compositions, and critical social essays only some of which are published. William Daniel moved to the United States in 1952, settled in Chicago, and later moved to San Jose, California where he passed his last years. One of William Daniel’s poetic masterpieces is the ornate work he wrote in both English and Assyrian on the occasion of the celebration of the 2500-year history of the Persian monarchy for which he received the Medal-e Homayouni (The Royal Medal) in 1971.